Kalya: this soup isn't the most extreme traditional dish yet it was one of the most expensive. While the recipes for many traditional Russian dishes have been lovingly passed down through families, other once-common meals have been forgotten — for a good reason. Learn about three dishes that are kept alive today only by devoted culinary aficionados. 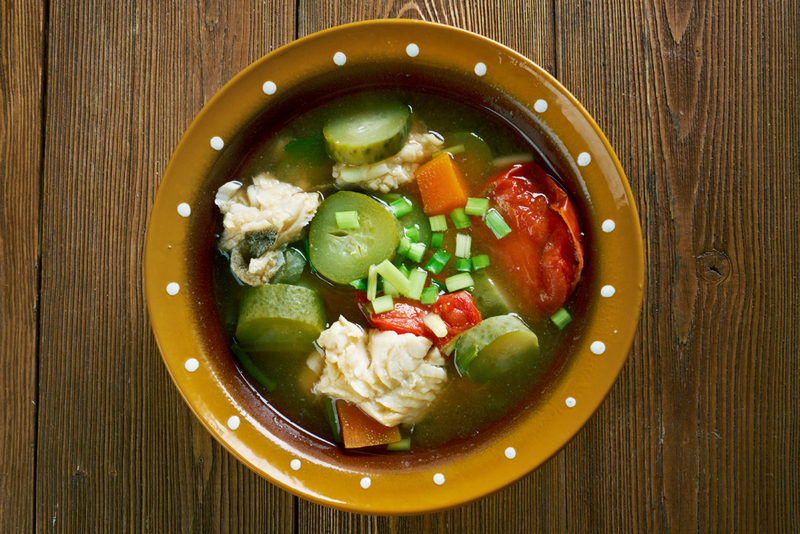 The origin of this fish soup is unknown, but it appeared at least by the 17th century and perhaps as early as the 14th. Kalya has much in common with rassolnik. Its key feature is oily fish (salmon, generally) or pressed caviar added to thick broth whose base is pickle juice. There are also versions of kalya made with duck, chicken or rooster meat. The pickle juice can be blended with kvass for the broth. The popular 19th century book “Obraztsovaya kuchnya” (“Iconic Cuisine”) recommends cooking kalya by boiling pressed caviar that has been mashed and mixed with cucumber and onion in a mixture of kvass and pickle juice. Kalya was a very expensive dish and was served on holidays only. Those who prepared it well had their own name — kaleyshchiks. 2. Add boiled pickle juice. 3. Chop fish and pickles, add to the broth. 4. Boil 8-15 min (depending on the kind of fish). 5. Add spices and lemon juice. Nyanya consists of a bag made from sheep’s rennet stuffed with a mixture of boiled buckwheat and minced mutton trotters, head meat and brains. This dish stands apart on the ancient Russian menu, and not just because of its ingredients: it was banned by the Russian Orthodox church because of its sacred value for the pagan Slavs. Nyanya has been known since the times of ancient Rus’; the first mentions of the dish date back to the 9th century. The main purpose of the dish was to utilize all the meat of a butchered animal. It was prepared mainly in the late summer and early fall when sheep were slaughtered. In Nikolai Gogol’s classic novel Dead Souls, the squire Sobakevich serves nyanya to the main character, Chichikov. Traditionally nyanya was cooked in an earthenware pot and had to be simmered for several hours. 1. Boil the mutton meat (traditionally trotters, head meat and brains, but if this is too extreme, any part of the meat will do). 2. Boil the buckwheat (it shouldn’t be soft). 3. Mince the meat with onions, add buckwheat and butter. 4. Scrape out the rennet bag, wash it, put the minced meat inside. Sew it up. 5. Put in a warm oven for 2-3 hours. Unlike kalya, tyurya is a really cheap and extremely easy to cook dish that was the go-to dish for poor people until the 19th century. Tyurya is a kvass-based vegetable soup that simply requires all the ingredients to be combined, which makes it quick to prepare. Most any root vegetables can be added to tyurya, and it’s also a good option for Lent. When making tyurya, white kvass is preferable. Radishes were traditionally used in tyurya since the radish was greatly valued in ancient Rus’ due to its health benefits. 3. Mix together, cover with kvass, add oil. Serve with bread.